'Home away from Home' for all those Texas A&M festivities. Spacious 3 bedroom, 2 bath one story town home only 2 miles from Texas A&M campus. A straight shot down Wellbourn Rd. Town home Sleeps 8 comfortably and 1 on a twin roll away bed. Come and stay for those Texas A&M football weekends, Parent's weekend, graduation or just a visit to College Station. Fully furnished kitchen with all the comforts of home. Enjoy a DVD, play some cards, read a book or work on a puzzle. Pet friendly with $50 pet fee per pet. Charcoal grill provided for your enjoyment. Plenty of room for multiple families to share. Count the ducks in the townhome! New queen bed in each bedroom, back bedroom also has twin bunk beds. Keywords: Spacious, comfortable one story town home only 2 miles from Texas A&M campus. Pet friendly, plenty of room for multiple families to share. 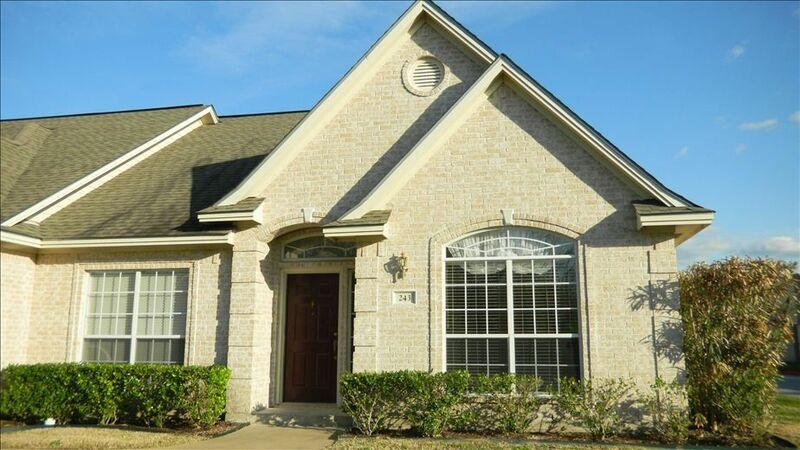 David and Pam bought this townhome for their oldest son in 2001 when he was a sophmore at Texas A&M. Their second son also lived here while going to Texas A&M. They have a daughter who is also attending Texas A&M and she lives in another of the townhomes that they own in the same complex. They bought a third townhome March 2016 next door to this one and have it listed on verb also. They have decided to share this townhome with out of town visitors to Texas A&M for home football games, graduation, Parent's weekend or college visits. We allow pets since we don't travel without our little 'Angel' our Yorkie and know how hard it is to find a place that allows special family members. Quiet,close to campus, clean 3 bedroom townhome. A quiet townhome community close to campus and all Texas A&M festivities. We’ve stayed at this property several times and are always very happy with the experience. We always enjoy our returning guests. Everything was pretty great especially for the price we paid. The girls who stayed in the front room did mention that the bed was very hard, and there was an issue with the hot water being gone almost immediately after one person took a short shower, but other than that the stay was great. Thanks! We have tried to make everyone's stay comfortable. What a great place to stay! My husband and I travel often and love staying in rental homes compared to hotels. The location was great- close to all the places we needed to go to. The property was well taken of- clean and well-stocked- even more so than my own home :) Pam was a pleasure to communicate with. We will definitely stay here again in the future and recommend this property to our friends/family! Was blown away by the Southern Hospitality that is this rental. From the outside looked like a nice house but I had no idea how quaintly appointed it would be once we got in there. All the little touches - decorated like someone lived there not like a vacation rental. The kitchen was stocked up very well, everything in working order appliance wise. Clean dishes in the cabinets, paper towels, couple bottles of water waiting in the fridge, I felt VERY safe in the kitchen. Some time shares you feel icky. Not at all - every counter top was gleaming and every thing was immaculate, clean dishrags and sponges ready to go even. Bathrooms were the same - very clean, stocked with TP and soaps, felt almost like a hotel cleaning crew had come in before us. The bedrooms were very comfortable, the beds made to perfection and the sheets were not the usual hotel junk. Very comfortable and I felt at ease walking around in my bare feet. Pam the owner was great to communicate with always returned emails very fast left us her cell number but we never needed her. She emailed twice just to check and make sure we were comfortable and everything was great. I'd highly recommend staying here if ever in College Station. We came down for a regional Christmas light attraction and to see some family. We needed our own space 12 is enough in one house, so we went here. Highly recommend going here. We welcome guests from all over the United States. We strive to show that "Southern Hospitality" to all our guests. Our "Home away from Home, duck pond" is stocked with all the necessties of home. Glad we were able to share our College Station rental with you. We travel many times throughout the year and always use homeaway or vrbo. This is by far the cheapest, noisiest place we have ever stayed. The towels are thin, flimsy walmart brand, sheets are super thin, as well as pillows. Front bedroom has a brick for a mattress, there is a memory foam on the back bedroom. Furniture is very old/dirty looking. The dishwasher & dryer were completely full upon arrival. Makes you wonder if anyone cleaned. (I'm sure we'll still get charged the cleaning fee even though I cleaned the tubs/toilets before we felt comfortable staying) The worst part is you will not sleep....AT ALL. Train tracks are across the street and run ALL NIGHT EVERY NIGHT and since there is a crossway right there they blow their horns all night! I wish someone would've let us know in reviews! I emailed owner the day we left of the problems (2 days ago) and never heard a reply back. Here's a tip- quit decorating with hundreds of ducks and put a little money in your towels, sheets, bedding, pillows and if you have complaints address them promptly. I definitely would not recommend staying here. Worst stay we've ever had anywhere. As a response to this review let me explain a few things. First of all this review is not at all a representation of my property, as you can see from my 5 star rating. I believe she is quite harsh in her review, and she has done this before to another VRBO owner. First, regarding the train, anyone who knows anything about College Station knows that the city used to be nothing but a train station and the train runs right through the campus. This is a well known fact for Aggie alumni and current students. There is nothing I can do about the train, and I never thought to mention the train since it is a well known fact. Regarding the beds, these beds are new, less than 5 months old. It is impossible to please everyone and I will be getting a mattress pad for the mattress she is referring to. My sheets are not cheap, nor are they the most expensive, but they are maintained and clean. My towels are used and maybe a few are worn, so I will be getting some new towels. The pillows are less than a year old and I do have 4 pillows per bed and extra pillows in the closets. I will be adding a few new pillows also. My furniture is not brand new, but not old and dirty. Each bedroom has an antique dresser and maybe she doesn't appreciate antiques. I will get the couch and over stuffed chair steam cleaned. This lady checked in the day after Christmas and yes there were CLEAN dishes left in the dishwasher as well as CLEAN towels in the dryer. All she had to do was call or text me and I would have been able to let her know that my cleaning lady cleaned on Christmas Day to prepare for her stay. I bet she didn't work on Christmas Day. We all make mistakes. Yes she did email me AFTER she left about the towels and dishes only, no other complaint, since she had already left I didn't feel that it was urgent that I respond,,but I did respond. I didn't see this review for 2 days after she sent it in so there was little I could do to make her happy before this unfair review was posted. And , I refunded her the full cleaning fee before I saw this review, that was the right thing to do. And after this review was posted I decided to be bigger and better than her and refunded her the full amount of "the worse stay she ever had anywhere." I do spend money on my property and take suggestions from my guests. Yes I have ducks as my decor thus called "Home away from home duck pond". I do address concerns and complaints promptly when brought to my attention. Additional $25/person per stay may be added for over 8 people due to additional cleaning and linen use. Rental rates are subject to change without notice.